Imagine a chocolate mousse that’s so rich and creamy, soft and airy with a delicate kind of sweetness. Made from A V O C A D O. If you would tell me a few years ago that you can make a chocolate dessert from avocado I would have been a bit sceptical. For most of my life I considered avocados to be 100% savory by default. Avocado in salads, on toast, guacamole and in green juices, sure.. But how can you possibly make sweet desserts from them? Well you can and not only that, you don’t taste a bit of the avocado in this recipe. I have a pro food tester living with me. Well he isn’t a real pro, he’d wish he was! But he has quite some experience with eating and preparing food. High standards and never sugar-coating anything, this man always tells things exactly how he sees them. When I asked him if he wanted to try my new chocolate mousse, I didn’t mention the avocado part. He loved the mousse and didn’t notice the avocado at all. This avocado chocolate mousse is not only delicious – it contains so many healthy ingredients that you can practically eat it as often as you like. Including for breakfast. The healthy fats from avocado and coconut and antioxidants from the cacao make this a true clean eating dessert. Guilt-free, without refined sugar or any other unnecessary ingredients. Just nature at its best. This avocado chocolate mousse with coconut cream is very easy to make and can be stored for up to two days in a sealed container in the fridge. After that it starts to lose its texture and taste. ⋅ Cut the avocado in pieces and freeze it. I’ve tried making this mousse with fresh avocado as well and while I liked the taste, freezing it makes it so much creamier and richer. ⋅ Take the avocado pieces from the freezer and let them sit for 10 minutes before you blend them in the food processor or blender. This will separate the cream from the coconut water and make the coconut cream concentration very thick. 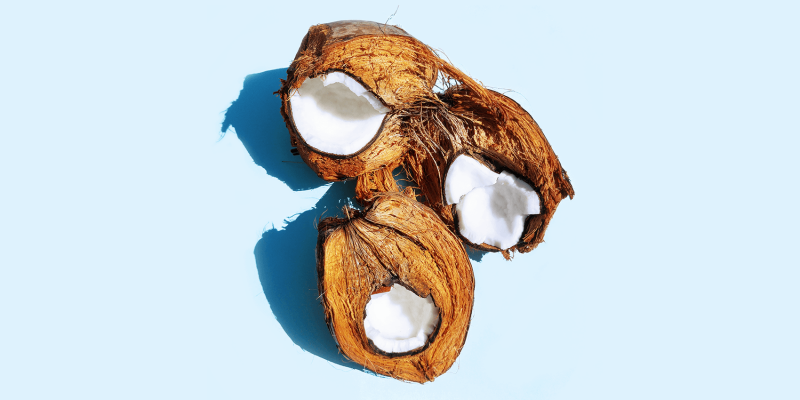 Scoop out the coconut cream and put the coconut water aside. You can use it later to make a smoothie. 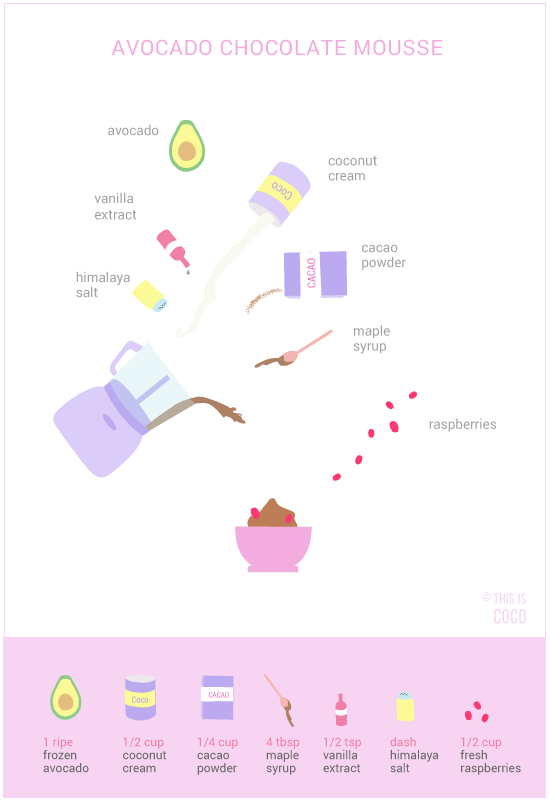 ⋅ Mix the coconut cream with the avocado. Add cacao powder, maple syrup, vanilla extract and a pinch of sea salt or himalaya salt to bring out the flavor. Make sure it’s all equally blended. 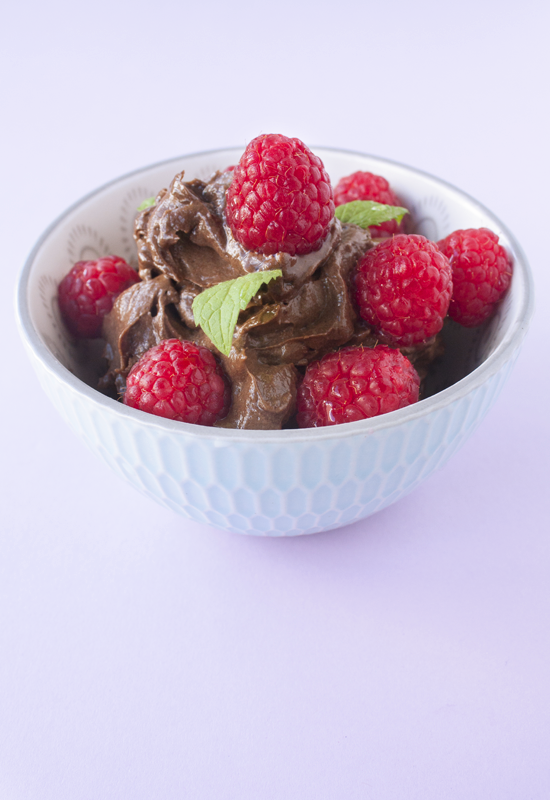 Serve the avocado chocolate mousse topped with some fresh fruit and mint leaves (optional). Enjoy!